Home Food Mushroom Latte Anyone? The global food scene is changing rapidly. From liquid nitrogen to ruby chocolate, new trends and ideas in food are developing steadily. The simple cuppa coffee which is among the most loved beverages is also getting a major facelift! The latte which till now was a simple cup of espresso and steamed milk, is being modified as per the likes of the health conscious. Keto coffee and superfood lattes are lately becoming very popular. Unlike ordinary lattes, these lattes usually don’t contain caffeine and use ingredients like matcha tea, turmeric, beetroot and green algae etc. to add colour. 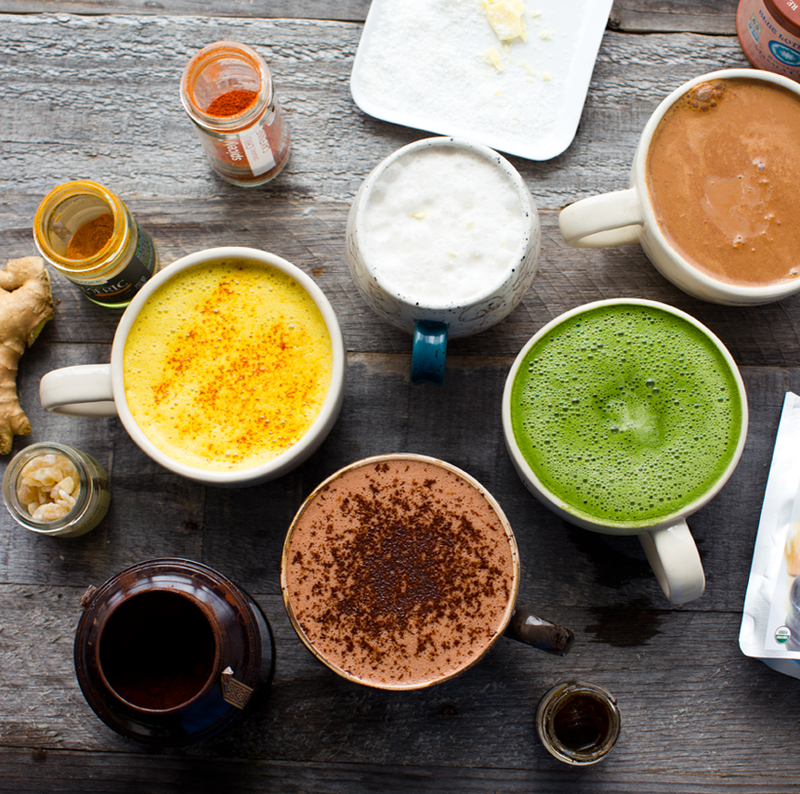 Here’s a list of some of these intriguing superfood lattes and their health benefits. Beetroot is a highly nutritious root vegetable, especially high in nitrates, It is low on calories and also helps in maintaining a healthy weight, lowering blood pressure. It helps in improving exercise performance. It is also high on antioxidants can can also detoxify the liver. Beetroot is also high on potassium, vitamin C, calcium, iron and zinc. The attractive pink color is just an added bonus. The best part is it’s very easy to prepare all you need is some beetroot juice, mixed with frothed milk and some sweetener which is optional. Turmeric, or haldi is an ingredient used extensively in Indian cooking. We all know the flavour as well as health benefits of Turmeric. Curcumin is the active primary ingredient of turmeric, and is an antioxidant and also has anti-inflammatory properties. Some people even suggest this spice is effective at delaying or possibly even reversing various cognitive ailments. All you need to make a rich and creamy Golden Turmeric Latte is some turmeric powder, coffee(optional), coconut milk, cinnamon a few drops of vanilla. Blend them all together to get the creamy Golden Turmeric Latte. The sweet flavour and captivating fragrance of rose is what makes it an attractive ingredient. It has many benefits, the most important one is it;s stress relieving properties. Besides that the antifungal, antibacterial, anti-inflammatory and antiviral properties make rose an excellent treatment for coughs, sore throats, fevers and even acne. Rose is often also used to treat bloating in the stomach. The rose latte has a very calming and soothing effect. All you need is some sweetener of your choice, rose water, rose petals(grind into powder) and coffee. To the black coffee add the rose syrup made with sweetner and rose water, add milk of your choice, blend and garnish with rose powder and petals. Charcoal Latte: The Next Big Thing! Some say that charcoal lattes can fix a hangover! Charcoal is gradually entering the mainstream food scene. The unconventional black colour and numerous health benefits make it a fascinating ingredient to use. Charcoal is used to cleanse the body, as it absorbs toxins. It is great for gut health, glowing skin and general well-being and some say that charcoal lattes can fix a hangover too! You need milk of your choice, activated charcoal powder, sweetener of your choice and vanilla essence. Blend them all together and your delicious Chacoal Latte is ready! It’s a super healthy latte! Mushroom has been a savoury ingredient for long, but it is gradually entering deserts, owing to the trend of using savoury ingredients in deserts. Mushrooms have great health benefits. Mushrooms reduce the levels of ‘bad cholesterol’ in the body, which unfiltered coffee increases. So it is a clever ingredient to combine with coffee. It is also low on calories, and high on Vitamin B, potassium and copper. For this super healthy latte you need mushroom powders (The chaga, reishi or lion’s mane mushroom powders are highly recommended by experts), just add it to your regular latte along with a pinch of salt and cinnamon and blend. Now that you know more about healthy lattes, go enjoy your latte and glow inside out! Next articleWhat’s That Selfie Which Got All The Biggies Talking?